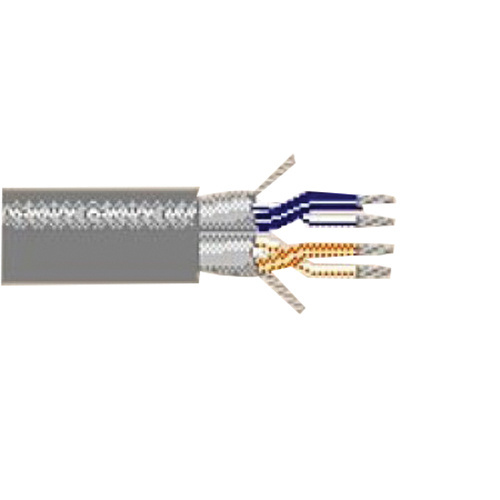 Belden 24/4 Plenum-rated multi-pair multi-conductor snake cable has 0.017-Inch gray fluorocopolymer jacket to withstand harsh environmental conditions. The 0.019-Inch fluorinated ethylene propylene insulation resists electrical leakage and offers protection against environmental threats. It has current rating of 2-Amps and voltage rating of 300-Volts. This tinned copper cable of diameter 0.261-Inch, has bend radius of 2.75-inches. It has 13.5 pF/ft conductor-to-conductor capacitance, 100-Ohms impedance and 24-Ohm/1000-ft resistance. This cable withstands temperature range of -70 to 150 deg C. It is suitable for indoor. Cable is UL listed, CE marked, CSA certified, RoHS compliant and meets NEC, EU Directive 2011/65/EU standards.